IPU MBBS & BDS Admission 2018 will be done on the basis of NEET Scores. The Guru Gobind Singh Indraprastha University (GGSIPU) has made the application form of IPU MBBS 2018 on 19 February. Only aspirants who have qualified NEET are eligible for admission to IPU MBBS admission 2018. Based on the applications, IPU MBBS merit list will be released in the third week of June. Based on the NEET scores the authority will prepare the merit list of IPU MBBS 2018. Candidates included in the state merit list will be called for counselling. Based on IPU MBBS admission, 400 MBBS seats will be filled by the authority. For more information on IPU MBBS admission 2018 merit list, counselling, seats matrix and other details, read the article below. Candidates can go through this article for complete information regarding IPU MBBS & BDS Admission 2018 like eligibility criteria, application process, counselling, selection process etc. Aspirants can check the dates of IPU MBBS admission 2018 from the table below. Age Criteria: The candidates should not be less than 17 years as on 31 December 2018, and the maximum age of the candidate must be 25 Years as on 1 August 2018. However, For SC/ST/OBC category candidates for MBBS/BDS, a relaxation of 5 years shall be granted on the maximum age specified. Nationality: Candidate should be an Indian or Nepal citizen. Non-Resident Indians (NRIs) are not eligible. Qualifying Exam: All the applicants have to mandatorily appear in the NEET 2018 Exam to be conducted on 6 May 2018. Scores Cards of NEET 2018 will be the basis of the admission. For MBBS: Candidate must have passed in Class 12 of 10+2 pattern of CBSE or equivalent with a minimum aggregate of 50% marks in Physics, Chemistry, Biology and English (Core or Elective or Functional) and also provided the candidate has passed in each subject individually. (40% in case of SC/ST/OBC candidate). For BDS: Candidate, who have passed 12th class examination under 10+2 system conducted by the C.B.S.E./ Council of the Indian School Certificate Examination/Jamia Milia Islamia, New Delhi with required subjects i.e. Physics, Chemistry, Biology and English from the recognized schools conducting regular classes situated within the National Capital Territory of Delhi only, will be eligible for admission for BDS Programme. 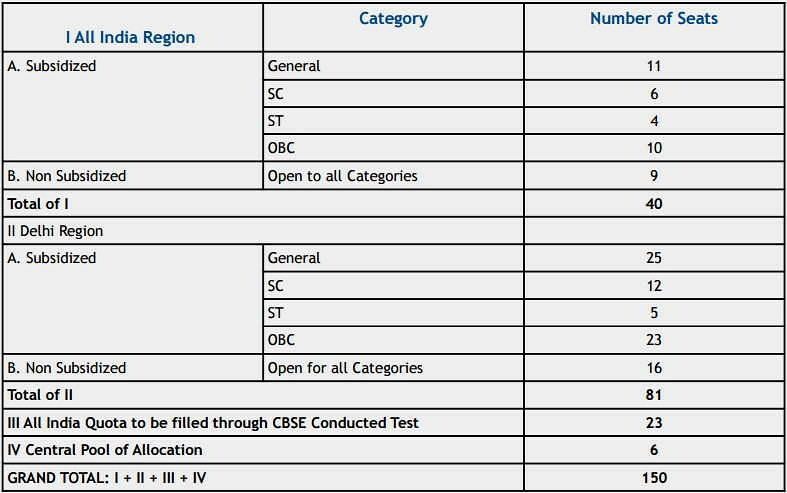 Candidate must have passed in the subject of Physics, Chemistry, Biology and English (Core or elective or functional) individually and must have obtained a minimum of 50% marks together in Physics, Chemistry and Biology (40% in case of SC/ST candidates, subject to the availability of seat for these categories in the respective institutions). Children of serving Army personnel with minimum 10 years continuous service in the Army. Children of Ex-Army personnel granted/awarded regular pension, family pension, liberalised family pension or disability pension at the time of their superannuation, demise, discharge or Release/Invalidment Medical Board. This includes children of recruits medically boarded out and granted disability pension. Children of Ex-Army personnel who have taken discharge or been released after ten years of service. Adopted Children of Army personnel if adopted at least five years before seeking admission. Stepchildren are eligible, provided they are born from a wedding where at least one parent belonged to the Army and who is otherwise eligible. Children of Army Medical/Dental Corps Officers presently serving with Navy or Air Force who have served in the Army for at least 10 years. Children of APS personnel classified as Ex-serviceman as per Govt. of India, Ministry of Defense, letter No 9 (52)/88/D(Res) dated 19 Jul 89. Children of APS personnel who are on deputation and who have put in 10 years of service in the Army. Children of APS personnel who are directly recruited into APS & completed 10 years of service and who as per their terms and conditions of service, retired from APS without reversion to P&T Department after completing their minimum pensionable service of which 10 years was in the Army. Children of members of MNS who have 10 years service as regular members of MNS or are in receipt of the pension from the Army. vi. Children of TA personnel who have completed 10 years of embodied service. As per the notification of UGC, the NEET scores is mandatory for admission to MBBS/BDS course in any government and private medical colleges in India. Therefore, to apply for the admission into MBBS/BDS course, the candidates need to submit their NEET score. IPU Online Process of Admission Counselling will start in July 2018, both for already registered and the new applicant. The candidates who have already registered for GGSIPU CET for MBBS and BDS and also has paid Rs. 1000 need not apply again but they need to upload their NEET details such as All India NEET Rank, NEET Roll Number, Category etc. along with other personal and academic details of the candidates. The candidates who have not registered themselves before into GGSIPU CET for MBBS and BDS programme earlier and are willing to register for MBBS/BDS course on the basis of NEET scores will have to pay Rs. 1000 as registration charge. Online Payment of Fees: The Application form is fully automated, so the payment has to be made online only. IPU MBBS & BDS Admission 2018 to the constituent Colleges of GGSIPU will be based on the All India NEET scores obtained by the candidates. After the Registration Process is over the University will conduct Counselling round to select the students to take admission into MBBS & BDS course. The candidates will be called in the order of merit and shall be offered the seat available at that point of time, All the candidates those who are allotted seats at the time of 1st counselling must report at the respective Colleges within the time specified in the counselling notifications. The classes will commence from the first week of August 2018. The admission of the candidate, who fails to report as per duly notified dates (in the counselling schedule) of the admission year, shall be cancelled. Finally, the candidates will be admitted and have to undergo the Medical Examination. Only those, who are certified to be medically fit by the Board will be admitted. If in the assessment of the Medical Board, a candidate is found medically unfit for admission to the course, his/her candidature will be rejected and rejection on the medical ground may be communicated by the respective Colleges to the University. Certificate of having passed the 10+2 or equivalent examination, showing the subjects offered by him/her in the examination. Certificate/ Marksheet from the Board from which he/she passed the 10+2 or equivalent examination showing that he/she has secured 50% or more marks (40 % in case of SC/ST candidates) in aggregate in Physics, Chemistry and Biology/Biotechnology and pass in the subject of English (Core or Elective or Functional). At the time of counselling/ admission in the University, candidates have to bring a Demand Draft of Rs. 30,000 and a separate Demand Draft of Rs. 1000 in Favour of Registrar, Guru Gobind Singh Indraprastha University payable at Delhi. NEET UG 2018 Score Card. Copy of GGSIPU Registration Form. Migration/Transfer Certificate from the University/Board last attended by him/her. Character Certificate from the head of the Institution from where the qualifying examination was passed or from Gazetted Officer. Certificate from the prescribed authority showing that he/she belongs to a Scheduled Caste/ Scheduled Tribe/OBC category. (Applicable only to candidates belonging to Scheduled Caste/ Scheduled Tribe/OBC category). Any other document as may be asked for by the University/College. No IPU CET Exam will be conducted for the MBBS BDS Admission, Candidates will have to appear in the NEET 2018 exam which will be conducted in pen and paper mode only and the total duration of the exam will be 3 Hours. IPU MBBS Colleges seats distribution is listed below for the all 4 GGSIPU Affiliated colleges. If any changes are applied to the seat distribution, they will be communicated here on this page. Get the Region wise and Category wise seats of the IPU MBBS Colleges below. IPU MBBS Merit List 2018 - Check Counselling Schedule!